I have just finished my work on Lorrie's tea time round robin block. These blocks were absolutely gorgeous before anyone even stitched on them. Lorrie used vintage linens and did the central cross stitch on each, added the hankie "tablecloth" and enclosed the other corners for us to use our imagination with, and even sent along a package of her grandmother's buttons and some tea cup charms for us to use on the blocks. It seemed like a shame to add anything to these blocks! I had so much fun with this block, so be prepared for me to go into excruciating detail on this one! lol Or, you can just look at the photo at the top and forget the rest - your choice! To start with, before I even saw the blocks, I knew I wanted to make a tea bag for Lorrie. I found some shimmery translucent white ribbon and used it to construct a tea bag with beads added as the tea. Since I used blue beads, maybe it is blueberry tea? I parked the tea bag on one of the lovely pieces of vintage linens Lorrie used for her block. I used my favourite silk thread to build a string of stem stitch from the tea bag to the cross stitch fairy. The pink I used for the string did not show up enough to suit me though so I went back and wrapped the stem stitch with blue. 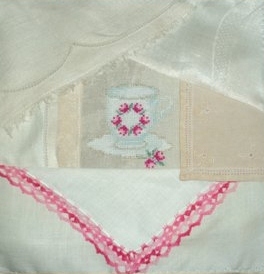 At the end of the string is a stitched tag reading "Fairy Tyme Tea". Kind of hokey but it was fun. I have huge respect for anyone who has the patience to do fancy hemstitching so I was not going to interfere or disguise that. Instead I stitched a row of chain stitch on either side of the handwork to highlight it, rather than distract from it. I used a lovely shade of Gloriana Princess Petite Perle silk thread called Fiesta. The lovely fringed edging I left as is. Lorrie had requested a fairy on each block and rather than add a fairy charm I used waste canvas and some variegated cotton floss to cross stitch a fairy silhouette. I wanted to point out the beautiful cross stitch teacup Lorrie used for the center of each of her blocks. She also had the edged hankie in place and provided us with the other corners of the hankies to use in some way. I decided that the hankie was the tablecloth under the teacup and the scrap would be a cloth napkin and I did some simple embroidery in green silk thread to coordinate the two further. I have several of these squashed velvety flowers that came out of a bargain bin at my favourite fabric and trim store and I used one of these to build the pansy on the block. I dismantled the flower and cut the pansy petals from the petals of the flower and buttonholed them in place. For the bottom petal, I wanted it to be three dimensional so I cut two petal shapes and buttonhole stitched them wrong sides together and then just attached it to the rest of the flower at the top. All that was left then was a few straight stitches in the center with yellow thread and it was done. The tiniest little motif is the tea cup charm, one of the ones Lorrie provided with her block for us to use. I added a tiny scrap of Nicki's hand dyed lace underneath to form a tablecloth or doily under the teacup and borrowed Cathy K's idea of using silk ribbon for steam above the cup. It is pretty difficult to see how this looked before I added the seam treatment but it had a hemstitched edge of the linen and a strip of lace adjacent to each other with a small space between. I took a piece of pink metallic trim and sewed it in the space, tucking it under the lace. I stitched a couple of pearl beads on the lace to hold it in place. Respecting the hemstitching again, I added a buttonhole stitch edge next to it with pink thread. On the right side of the lace, I back stitched a row of pink beads in place along its length. On the left side of the hemstitching I added some small green ric rac, stitched down with pink straight stitches. It is my favourite seam on this block. You can see it in the photo above. On the right side of the block, under the fairy, I did a seam made up of two rows of herringbone stitch, one in pink and one in green. On the top and bottom of the herringbones, I alternated pearl beads and rosebuds made with a pink detached chain stitch and green straight stitches. On the piece of linen underneath, I duplicated the original hemstitching stitches using variegated silk perle thread. I added a pearl bead to the center of each cluster of bullion stitches that were already part of the linen. Lastly I added a small bit of lace dyed with potassium permanganate. Finally at the bottom I added a button cluster. First I laid down a piece of vintage lace edged with pink french knots. Then I added some of the buttons from Lorrie's collection, a heart charm, some small ribbon flowers and a few more pearl beads. This was a wonderful block to work on and I enjoyed it thoroughly! My wonderfully embellished blocks arrived home in the Tea Time DYB I am in. Thank you to Cathy K, Cathy L, Lorrie, Peggy and Ritva for your stitching! I have one block left to embellish myself and then I need to decide what to do with them all! 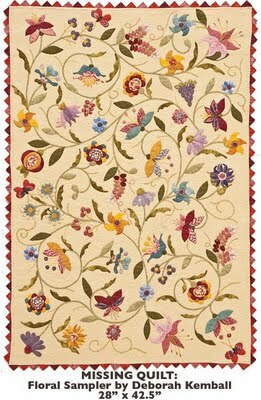 CT Publishing has recently announced that a few quilts, in their guardianship, disappeared after Spring Quilt Market. They've done everything they can do to find these quilts and are now asking for our help to find 3 cover quilts and a table runner. The quilts have gone missing from a quilt show. Please take a good look at the photos, and watch for these turning up somewhere. CT Publishing, who had these quilts in their possession, has offered a $4,000.00 reward for the return of the quilts. If only one quilt is found, the reward will be pro-rated on the appraised values of the quilt. 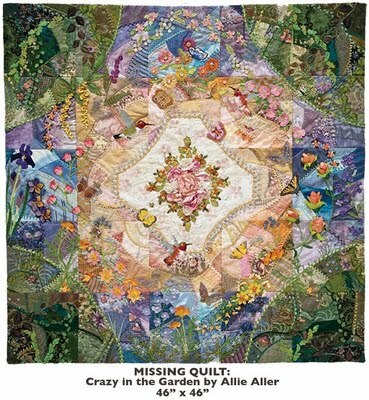 It breaks my heart that Allison Aller has lost her beautiful crazy quilt especially. This quilt is such a work of art from Allison's heart and hands, and is definitely irreplaceable. Years ago, my mother entered a large embroidered tablecloth in the local handicraft show. The tablecloth was embroidered by my sister, who was away at university at the time, and my mother acted out of a sense of motherly pride in her work. Mom could imagine how excited my sister would be when she told her after the fact that she had entered the tablecloth and it had won a ribbon! Well, after the show the tablecloth was not to be found - someone had "lifted" it! Fortunately, my mother was able to obtain the same materials again and she and I stitched feverishly and replaced the missing item before my sister arrived home at Christmas. She was never the wiser. I still remember when the item was not there at the end of the show and competition: the disbelief; the frantic searching; and finally the sick feeling settling into the pit of our stomachs. Both my sister and I learned embroidery at my mother's knee and our work was all very similar at that time so we could "fix" this. These quilts that are missing are not something you can replicate or replace. 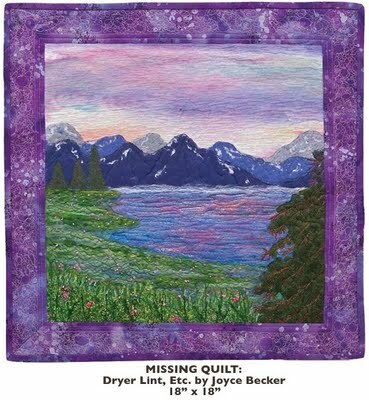 I hope you will help increase awareness of missing quilts and help in the effort to get missing quilts back into the hands of the creator and/or respective owners. I was born near the ocean, in the Maritime provinces, and my heart has remained there all my life. Once in awhile I have to remind myself of what I like about the prairies where I have made my home for the last forty-odd years. One thing, of course, is the big sky. Stand on the prairies and you can see the horizon far in the distance in every direction. When you look around there is more sky than land in your view. My brother is fond of saying that when the wagon trains came across the prairie, they would get up in the morning and go all day before setting up camp in the evening. Then they would be able to look back and see where they had camped the previous night! This field of canola is a common site and is one of the reasons that flying into the prairies is such a visual treat - the different colours of the crops create a patchwork quilt for your eyes. Since the blocks of crops are not all the same size and shape I guess it would be considered a crazy quilt! When I came here, flax was also seen in the fields and the dusty blue blended with the yellow of the canola, the gold of the wheat, and the other crops. I miss seeing the flax fields now no one seems to grow it anymore around here. I think there is a little girl in all of us who thrills to seeing horses at pasture along the roads. I have to say I prefer seeing them to an endless array of cattle. You don't see as much cattle as you once did since a lot are biding their time at feedlots now. In the early spring, you can see the calves in the fields though and that's pretty wonderful. Amazing that such playful little creatures grow into their stodgy adult counterparts. The horses are always there along the roadsides though and seeing them never fails to give me a thrill. You might really wonder about this photo but it has me pretty excited! When I went home this week to collect my mail from the post office what had seemed like endless highway work was done and, lo and behold, there is a turn lane off the highway onto the road where my village is! Whoo-eee! What's next? A stop light?! lol I am sure this little turnoff will save lives and it is a good thing. Getting across that lane of highway was sometimes a bit nerve wracking with one of the big trucks coming along quick and another one at your back showing no signs of slowing down. So, that's my bit of the world! Maybe one day I will retire within reach of the ocean breezes but for now it doesn't look like it. I was saddened to read in my mail yesterday that FiberArts magazine has come to an end - this is the last issue. Kind of the end of an era. How many fiber artists have been inspired by this magazine? How many have been featured in its pages? Sad to see good things end! In honour of Fiber Arts magazine and all the inspiration they have provided over the years, I'm giving away this copy of the last issue. Leave a comment on this post and tell me something that inspires you - a magazine, a book, nature, whatever. I will draw a name on Monday, July 18th and get this mailed off to you! Well, since I can't share my most recent stitching, I'll tell you what I have been reading instead. 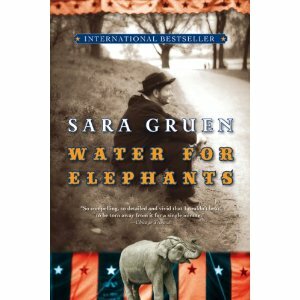 This is my absolute favourite book so far this summer - Water for Elephants, written by Sara Gruen. It is a historical novel, set in a circus during the Great Depression. I could not put this book down. I know there is a movie that has been made but after reading the book, I do not want to see it. I don't want anything to spoil this book for me. Thank you to Janet for another great book recommendation! 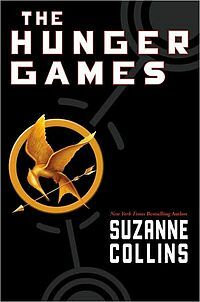 The Hunger Games, written by Suzanne Collins, is the first book in a trilogy and is another of Janet's recommendations. Thanks Janet! This is actually a young-adult book, but don't let that turn you off. It is well written and I am looking forward to the next two in the series. It is set in post-apocalyptic North America. Try to imagine the reality show, Survivor, but where after the game the one who outwits, outplays and outlasts is also the only one left alive! I picked up these two books at the library this week.Who could resist the story of a kitten dropped into the book return slot of a small town library one cold winter night, especially when he goes on to call the library home for the next nineteen years? 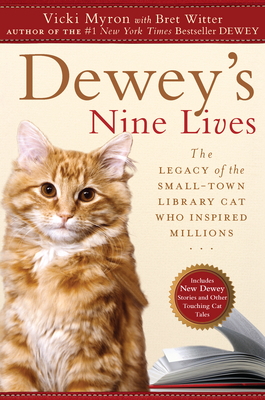 That is the story of Dewey Readmore Books, "the small town library cat who touched the world". 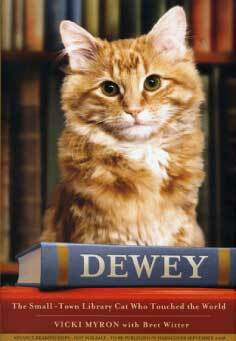 Both of these books are written by Vicki Myron, the librarian who adopted Dewey. I was a little disappointed to realize I had read the first book last summer - you know how you get through the first paragraph when you figure that out? The second book is a series of cat stories, nine of course!, and I am enjoying that one now. I am a sucker for animal stories! I watched a couple DVDs while I was stitching this week too. 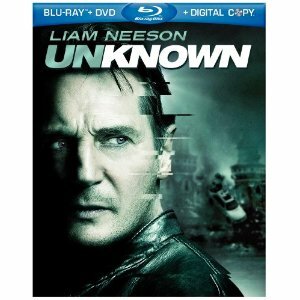 The first was Unknown, featuring Lian Neeson. In spite of how much I like Lian Neeson, I have to admit this movie didn't really do it for me. It is an action/thriller but for me at least there was something missing in the storyline. So, if you have been thinking I love everything I watch or read, here is the exception to the rule! This is the seam treatment I made using the BAS #72, Zigzag Stitch. I really liked this one because of all the angles and spaces to add more embellishment. I added trios of detached chain stitch and more straight stitches in blue inside the boxes. Sorry about the photo quality - not sure what went wrong with this photo! As promised, here is more on my process on the little quilt I wrote about in a recent previous post. Now that the piecing was done and all the securing of seams with invisible ladder stitch, the fun begins! There were lots of short little seams on this so it was a great chance to try some new seam treatment ideas and to use old favourites. The colours on this quilt were so much fun to work with - I got a chance to drag out all the bright threads I have stashed but never get a chance to use! This one was fun! (Please ignore the messy right end that eventually disappeared when the binding was sewn onthe quilt.) I started with two rows of Chevron Stitch, stacked in such a way that they create large diamond spaces. Next I added a piece of ribbon above and below the chevrons that matched the mauve of the thread. I had these two star beads I wanted to use so they went into the diamond spaces. Matching blue thread then made the straight stitches as well as a row of chain stitch in the center of each ribbon. More fun! lol If you look closely you can see this started as a simple vertical row of feather stitch, worked in green Gloriana Princess Petite Perle silk thread. Once again, I had these flower beads, but only three of them so I sewed them on with a couple detached chain stitches at the base of each flower. I tried to follow some rules as to where I put the rest of the detached chain stitch "leaves", because in nature there are set ways that each plant grows. I decided that on this plant, the end of the little stems that do not have flowers would have three leaves on them. If they were longish stems, more leaves would grow down the stems in pairs. And, lastly, sometimes where a new branch was perhaps thinking of growing out at the base of a "v" there would be one little leaf. I think that making rules for your embroidered plant growth, even if the plant is imaginary, makes it look more realistic. Nothing exciting here! I used a little hippo button and if I had more time I think I would have gone back and embroidered him a little scene with grass and maybe a tree for shade. For the buttonhole stitches I needed a template so I used half of the base of a Bic lighter. Necessity really is the mother of invention! I collect all kinds of buttons and I have a weakness for some of the older plastic buttons that might not be old enough to really be considered vintage, like these two cup shaped yellow flower buttons. With all the colour on this quilt, I finally found a place to use them! I embroidered them little stems and leaves and then secured them with a green bead in the center of each. Another simple seam of long and short buttonhole stitch and french knots. The meandering "pearls" are just a piece of that cheap plastic bead trim, couched down. The seam at the bottom is covered with several rows of feather stitch in a variegated thread. Another chance to use some of my not-quite-vintage plastic buttons! Aren't they adorable? I love the colours and the shapes of them. The seam to the left is zigzag stitch with blue straight stitches added. The seam on the immediate right is a simple herringbone stitch with trios of detached chain stitch in a scrumptious variegated thread. Next to that is an experiment with a chain stitch variation - not too sure on that one! The bit of lace was dyed at the fabric manipulation class I took at EAC Seminar this year but the pale blue and yellow used don't show up much in the photo. I had the shortest little piece left of some of Nicki Lee's wonderful dyed lace. How I wish I could get results like this with my dying experiments but I can't so I have to content myself with buying her gorgeous stuff at her Etsy shop, Raviolee Dreams. I wanted to add a little work to it as well so I did a satin stitch in a matching silk thread in the center of each section. I used a Pyramid Buttonhole Stitch for the top seam in this portion. Under that seam, I secured another baby button, this one of a Mom and Baby Rabbit. It had been my intention not to use any embellishments other than the seam treatments, but the beads and buttons kept falling into my hands so what could I do? Under that is a seam of Cretan Stitch with added Detached Chain Stitches. One more thing - if you head over to AAQI right away you can still catch the July online auction and see all the lovely little quilts up on the block this month! Here in Canada, we celebrate the confederation of our country every year on July 1st. In honour of Canada Day, I got up at 5:00 so I could have my morning chores done in time to go to the nearly village of Milo for the free Canada Day breakfast held at the Community Hall every year. The population of Milo is approximately 300 people but I know more than that come through the breakfast during the two hours it is on. Sausage, bacon, scrambled eggs, pancakes, juice and coffee are served to the masses by the local Lions Club! This well tanned but cheerful grey-haired lady is yours truly. As you can see, I thoroughly enjoyed my breakfast! It was a nice break to take an hour out of a very hectic weekend to share a meal with the good people of Milo and celebrate! I am on my own here today, as my husband left after breakfast to go to the city for the opening game of Calgary's CFL team, the Stampeders. Wishing everyone a happy Canada Day and to my friends south of the border, have a great 4th of July!